1. Please come early as Late comers will not be allowed to join the ride as this charity ride is will be executed on a convoy basis. 3. IF YOU DO NOT HAVE A BICYCLE, PLEASE MAKE THE NECESSARY ARRANGEMENTS BEFORE SIGNING UP! 4. Participants MUST use a helmet (cycling) during the ride. Pink Charity Ride 2015 is open to everyone. 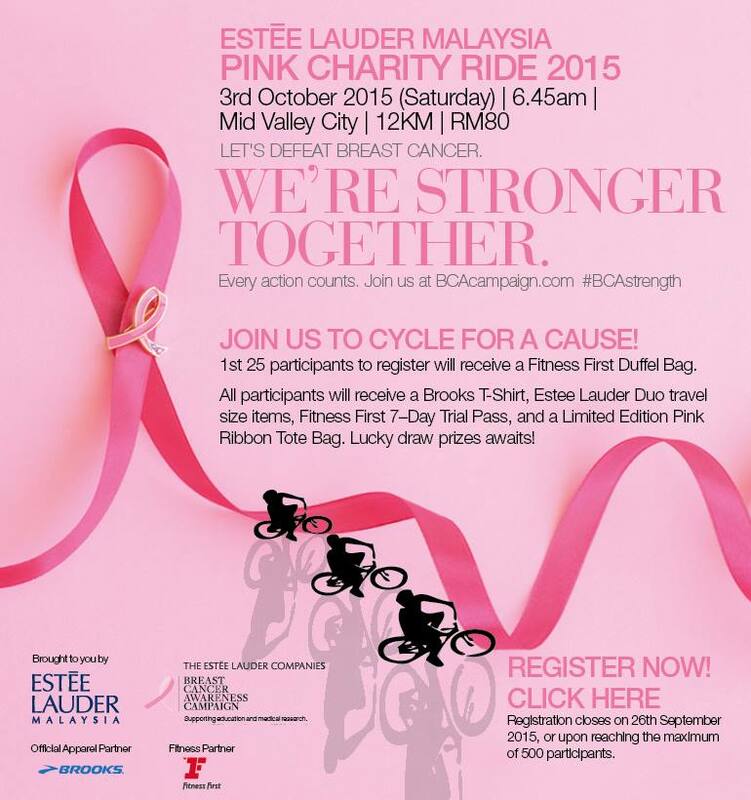 All participants must have a bicycle in order to participate in Estee Lauder Malaysia Pink Charity Ride 2015. Minimum age qualification is 18 years old and above. The entry fee is RM 80.00 per participant. All the entry fees collected will be contributed to the 4 selected beneficiaries. Bicycles are based on first come first serve basis. Please do call and make the rental arrangements directly with the bicycle shop earlier. All the bicycle rental arrangements are at the discretion of the participants and the bicycle shop. The organizers will not liable for any dispute arising from any bicycle rental arrangements with the bicycle shop. Finisher Medal and Certificate will be distributed at the finish line to all participants. The 1st 25 participant to register will receive a Fitness First Duffel bag. Any online registration that is not followed with online payment will become invalid registration. Therefore please ensure to pay online when you register online. Substitution of participants is NOT allowed. The decision of the Competition Committee is final when accepting entries. The organizers have the right to refuse an entry without having to disclose a reason. Each and every participant shall receive a Brooks T-shirt together with a number bib before the ride. Collection of Goodie bag (Estee Lauder duo-travel items, Fitness First 7-day Trial pass, and a Limited Edition Pink Ribbon tote bag) will be upon completion of the ride. The goodies bag must be collected on event day during the stipulated collection hours. The organizers reserve the right to delay the commencement of the ride in the event of heavy rain or thunder storm or extreme weather condition. Should the heavy rain, thunder storm or extreme weather condition persist after delay, the organizers reserve the right to cancel the race without any refund. In the event of heavy rain or thunder storm or catastrophic or natural disaster resulting in a postponement or cancellation of the above event, the organisers shall not be held responsible for any claims whatsoever in any form made by any individual or parties concerned. Whilst every reasonable precaution will be taken by the organizer to ensure the participants safety, participants are strongly encouraged to go for a medical examination and/or consult their medical practitioner prior to registration and before the actual event day. Saturday 26th September 2015 or upon reaching the maximum of 500 participants. Thank you choose to share your personal information with third parties. I hope you keep writing good articles like this. Thanks! Thanks so much...Please visit adress and Play, comment & Share on your FaceBook, G+, Twitter...pages. Love Everybody! Thank you very much! Top one best include 3D, 4D, 5D flash online fun kids. Cu toate acestea, pentru că este pe paginile site-ului nostru sunt adunate cele mai faimoase jocuri de cazino pentru bani gratuit și reale https://multabafta.com. Amazing post! This is perfect blog for anyone who is looking for topics like this. It has got it all, information, benefits and overview. A perfect piece of writing. Good job. Hey Look Ma! I sat in a JAGUAR!